Castlemont Home & School Club is a 501(c)(3) Not for profit, organization. This year's Art themed 30th annual Jog-a-thon will be taking place on Friday, May 24th and is a fun event for all students to participate in. The goal for this year is to raise $10,000 and one way to help achieve that goal is the family sponsorship of the Jog-a-thon t-shirts. With a family sponsorship, your families name will appear on the back of the shirt and will also be recognized during the event as a sponsor. If your family may be interested, please see the flyer sent home in the Monday envelope. Extra copies are available in the school office or you may download and print a copy by clicking the link below. The HSC is also still seeking business sponsors for the t-shirt. There are varying levels of sponsorship options and all include the business name or logo printed on the back of all the shirts. If you know of a business that may be interested please reach out to the Jog-a-thon Chair Emily Winters at eloek@yahoo.com. It can be a business you own, work for, or one you frequent often and would love to support the amazing students and teachers at Castlemont. Both the family and business sponsorship requests are due by Friday, April 19. Without the wonderful sponsors, the Jog-a-thon would not be possible! 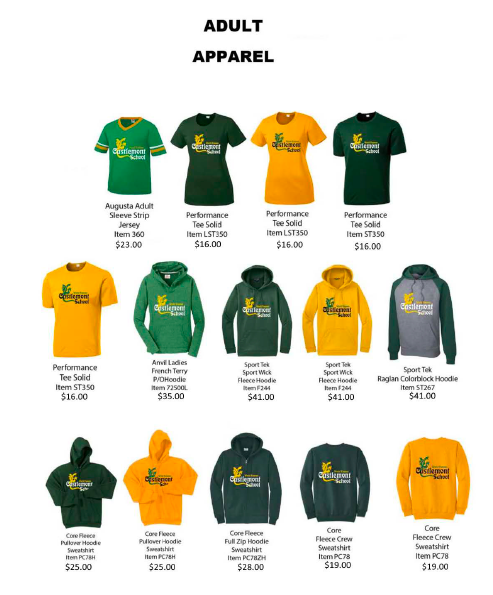 Spirit wear is available for order several times a year. If you are interested in placing an order please email Kelly, kelsacevedo@gmail.com.